Welcome to Larry's Tree Sculpture gallery. Scroll down to choose a slideshow. 'Fly Fisherman' aka "Sandy meets 'ol Goliath"
The town of Basalt, CO. commissioned Larry in 2007 for this public art. It stands at the corner of Two Rivers and Midland streets. In 2011 we drove 2000 miles for Larry to carve this monumental tree sculpture of a field English Cocker Spaniel flushing out a pheasant. This was generously commissioned by Joshua Creek Ranch in Boerne, Texas. has ever been commissioned for. This huge Sycamore tree is in Montecito, California at a private residence. They have requested flowers, hummingbirds and the foliage of a tree. And of course, Larry can carve it! We have been here since September, working five days a week. The tree circumference is 19 feet, and it is 18 feet tall. Below is a slideshow of Larry's work in a timeline. 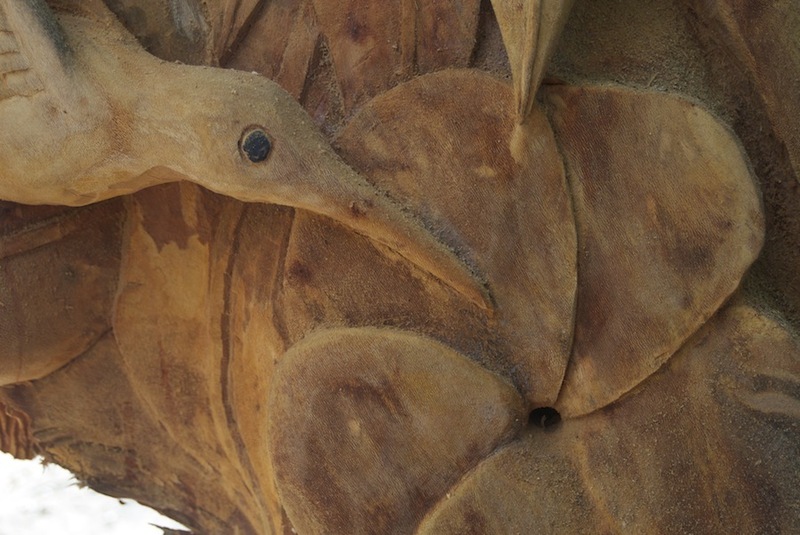 The larger images show the beginning, the details and the finished sculpture.